Iodine is a micronutrient of public health importance. It is an essential component of the hormones produced by the thyroid gland which are essential for mammalian life and thus, Iodine is essential for a healthy, human life. Iodine deficiency leads to a range of disorders known as IDDs (Iodine deficiency disorders) which can affect persons of all ages, including those still in the womb. It can lead to thyroid enlargement (known as a goiter), impair fetal brain development and can impose on a newborn infant a lifetime intellectual deficit. Iodine is distributed in the earth’s environment in form of Iodide found mostly in seas and oceans. Iodide undergoes oxidation to form volatile, elemental Iodine which evaporates into the atmosphere and returns to the soil by rain in a process known as “Iodine cycle”. 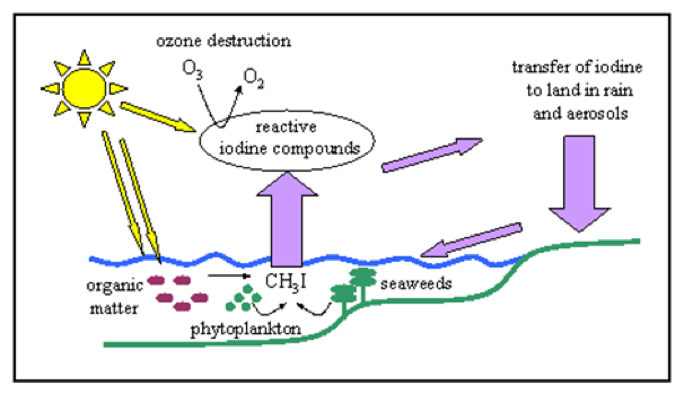 Human dietary sources of iodine include seafoods, plants grown where soil contains iodine and the meat of animals whose forage grow in such soils. Breastfeeding babies get their supply of iodine from their mothers’ breasts as the mammary gland concentrates iodine and secretes it into breast milk to provide for the nursing infant. Iodine deficiency according to the World Health Organization (WHO), is “ is the world’s most prevalent, yet easily preventable, cause of brain damage”. It can affect a child’s mental health and/or survival; reduce a child’s intellectual capacity and can cause stillbirths in pregnant women. Serious Iodine deficiency in pregnancy can lead to congenital abnormalities such as cretinism; an irreversible form of mental retardation in the child. The various impacts of Iodine deficiency led to several acts and regulations by NAFDAC (National Agency for Food and Drug Administration and Control), and SON (Standard Organization of Nigeria) on salt iodization in Nigeria. · Any salt used as an ingredient of food for direct use by consumers, food manufactures or as a carrier of food additive shall meet the standard requirement for food grade salt as set out in these regulations among others. · Be fortified with iodine using sodium or potassium iodide or iodate at a residue level as specified by the Agency. · Salt Iodization shall carry the logo of a green map of Nigeria with black edge and three human figures in white. The SON standard defines properly iodized salt as "containing above 50 ppm (parts per million) iodine at port of entry, above 30 ppm iodine at distributor and retail levels and above 15 ppm iodine at household level" The SON standard also specifies the over-all quality parameters for food grade salt. While we have little or no control over the iodine content of the seafood and other items we consume, we need to ensure we use only iodized salt in our cooking. 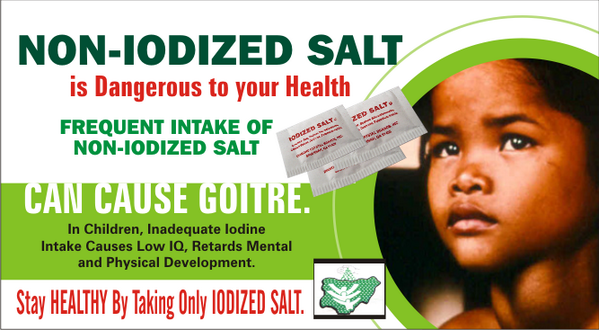 It is advisable to buy edible iodized salt in smaller packages as those that come in very big bags are prone to exposure and therefore increases the chances that the iodine has been leached.